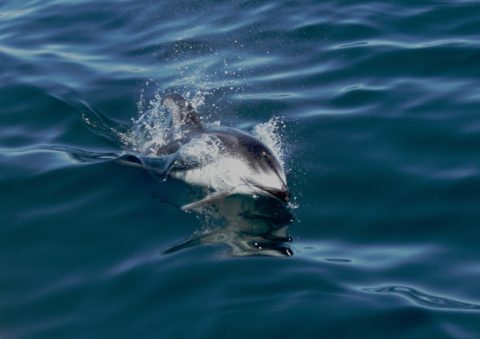 Here are favorite dolphin swimming pictures, from my dolphin pictures album. Pictures of dolphins are a great source of inspiration. Get some posters of dolphins, put them on the wall, and the frequency of the room is changed. Five dolphins, swimming in their natural environment. Not your usuall dolphin picture: This is a Pacific Whiteside dolphin swimming in the wake . Take a look at the oblique shape of the head. 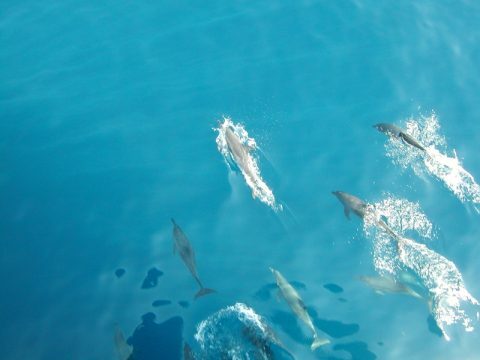 Welcome to the experience of a lifetime - swimming with wild dolphins. What are the best places? What to take? And how to prepare? Here is a checklist. How to select pictures of dolphins? Take a look at my pictures of dolphins selection guide. Also, take a look at hitech-dolphins recommended sources of big dolphin posters, dolphin information, free dolphin screen savers, amazing dolphin art and beautiful dolphin clip art and cartoons.